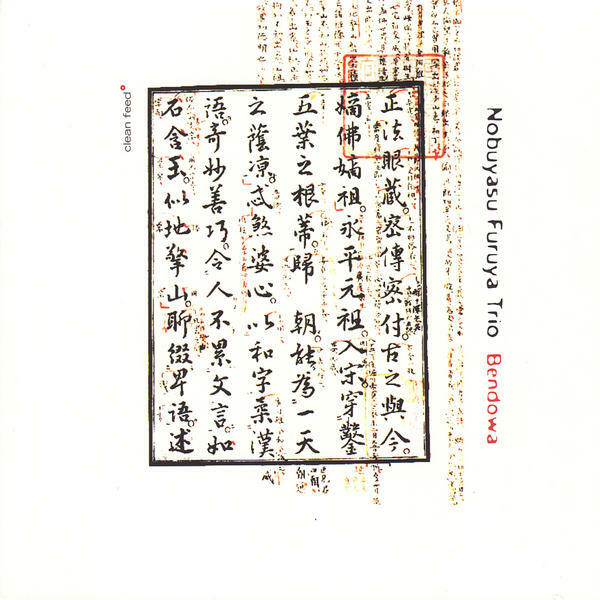 Born in Japan, but living and playing in Lisbon, Nobuyasu Furuya is agitating the waters of the jazz and improvised music scene in Portugal either with his smashing blow, remembering the washes of sound by Archie Shepp and Peter Brotzmann, or with an implacable energy control and rigor, the same we find in the Japanese tea ceremonies, bonsai trees and stone gardens. In his youth a cook apprentice in a Zen Buddhist temple, Furuya began to play baroque European music, but soon free jazz focused his interest. A composer for dance, theater and cinema, he also played in noise and ska-core bands. For some time, this multi-instrumentalist (tenor saxophone, bass clarinet and flute) studied the Ottoman classical music from Turkey, and this experience influenced his future options. In Furuya’s Portuguese trio, we find double bassist Hernani Faustino and drummer Gabriel Ferrandini, both of them musicians who play with guts and brain, a not very common combination. The music in Bendowa, the title of a 13th century book written by Dogen, the monk who founded Soto Zen has everything to surprise you. I play because I have something to say: it can be silence and murmur, or it can be a shout : says Nobuyasu Furuya.